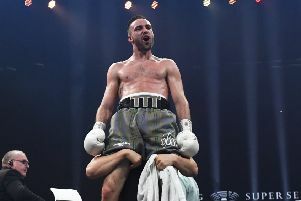 EDINBURGH’S Josh Taylor proved he has what it takes to make it to the very top with a sensational fifth-round stoppage over Dave Ryan last night to become the new Commonwealth super-lightweight champion. Taylor’s power and precision was a cut above his Derby opponent at Meadowbank, Ryan looking a shadow of the fighter who had defeated current British champion Tyrone Nurse in 2014 to win the same belt. However, there was never any chance of him reclaiming the prize as the Scot, in just his seventh professional bout, pummelled the 33-year-old Englishman to earn his seventh consecutive stoppage. The ‘Tartan Tornado’ produced a strong first round but moved up a gear as the minutes ticked by in the event which was broadcast exclusively live on Channel 5. The Prestonpans star made his breakthrough in the third round, knocking a weary looking Ryan to the canvas with a powerful left hook. Roared on by a partisan crowd who, like Taylor, sensed another stoppage was just around the corner, he dropped Ryan again in the fifth with another right body hook. His opponent took almost ten seconds to return to his feet and, despite his best efforts to continue, referee Michael Alexander brought the contest to an end. “I’m on cloud nine, I just feel brilliant. I felt pressure, but I soaked it all in and got the win,” a delighted Taylor said. Earlier, Jason Easton got a raucous home support in full swing when he delivered the first stoppage of the night to become the new Celtic super-lightweight champion. The former Craigmillar amateur simply blew Rhys Saunders away, dropping the Welshman three times in the second round before the referee brought the fight to a halt. Easton, 25, has now gone eight undefeated since signing with manager Billy Nelson last year and showed why he is considered one of the country’s brightest prospects within the paid ranks. The Scot was weakening his opponent by the punch with a string of body shots and the count came just 90 seconds into the second round as Saunders went down like a wounded animal. Try as he did, he was sent to the canvas for a second and again a third time before his punishment was brought to a halt. John McCallum had kicked off the evening with a dominant display against Norbert Szekeres from Hungary, winning his six-round contest 60-54 to register his tenth professional win of his career. The Capital fighter was fast out of the traps from the first bell, despite revealing post-fight he had been struggling with jet lag, having returned from New York only two days prior to the fight. The 28-year-old, though, was superior in every department, making good use of the jab and firing off some forceful body shots. McCallum sensed the stoppage was on and went for the jugular in the fourth round, pinning the Eastern European against the ropes. However, the Scot had to settle for a points win in what is likely to be one of his most straightforward duels since he started boxing. “It was good to get six rounds in. I was suffering from a bit of jet lag, having arrived back from New York just a day or so before,” McCallum said. “I felt quite drained, and I struggled to sleep on Thursday night with all the excitement of fighting back in Edinburgh again, as it’s been a while. “I actually jerked my right elbow so I had to turn to southpaw. My corner was pushing for the stoppage but I was glad to get some rounds in. Meanwhile, Glenrothes’ Connor Law swept aside Jose Manuel Lopez Clavero 80-72 and British flyweight champion Andrew Selby stopped Felix Moncada in the fifth round.